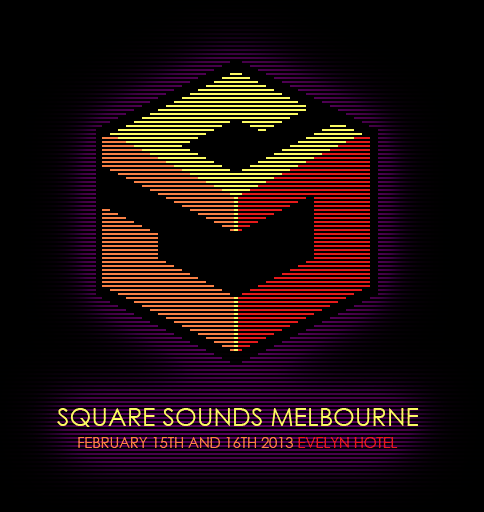 Your esteemed editor Dave and myself jetted off to Melbourne on Friday 15th March to attend to the inaugural Square Sounds Festival. 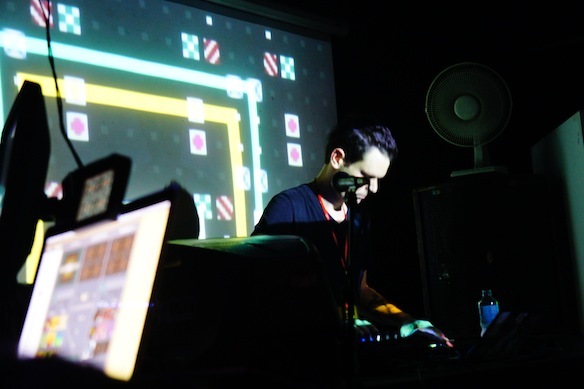 Arising from of the ashes of Blip Festival, the organisers of Square Sounds (a quarterly chiptune event in Melbourne) curated an eclectic posse of musicians and visual artists to perform over two nights. 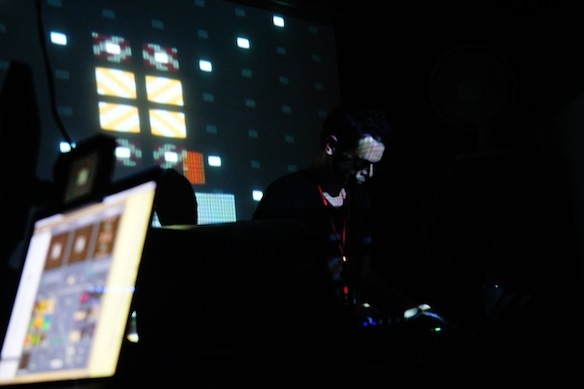 In their words, they handpicked “some of Australia and the world’s best chiptune, micropop, skweee dreamsynth and experimental electronica, they have brought together a line-up full of retro soundscapes and 8bit visuals that will be an audio visual feast for the senses made to get your feet moving and your head bobbing.” On top of this, they squeezed in an ‘open mic’ event on Thursday night for up and coming artists to ‘have a go’ (by all accounts this was a great night), a variety of workshops (including one by Adelaide’s own little-scale for creating a USB/MIDI sound chip module), and an after party (probably still going as I type this safe and sound in Adelaide). This was definitely very impressive and ambitious beginning for what will hopefully become a yearly event, though the realities of working life meant that I was only able to attend the ‘main event’ on Friday and Saturday night. 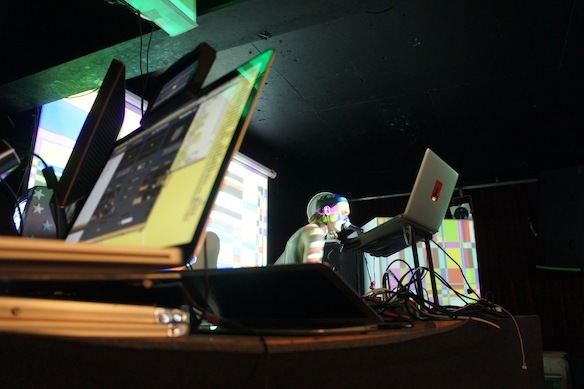 Though I was only familiar with a few of the artists at Square Sounds, part of the attraction in making the journey was to witness how they all brought their own styles and backgrounds to the fore when playing live, not to mention the different methodologies underpinning their set – laptops, old gaming hardware, DJ equipment, ‘traditional’ instruments…or a combination of all of the above. starPause (website, Facebook) was playing when I arrived, but by the time my ‘hellos’ were done, he’d almost finished. 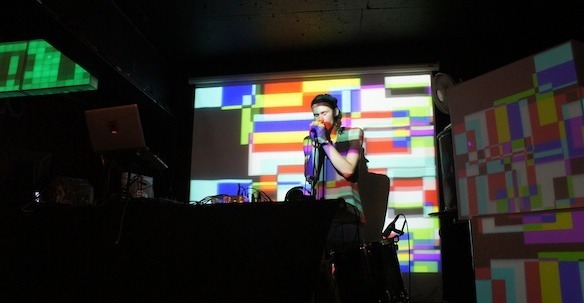 Minikomi (myspace) was up next and played a funky, glitchy almost minimalist (by my reckoning anyway, others’ opinions may differ) set full of dancey bleeps and bloops…not forgetting the airhorn that was triggered at opportune moments! A small snippet can be seen here. 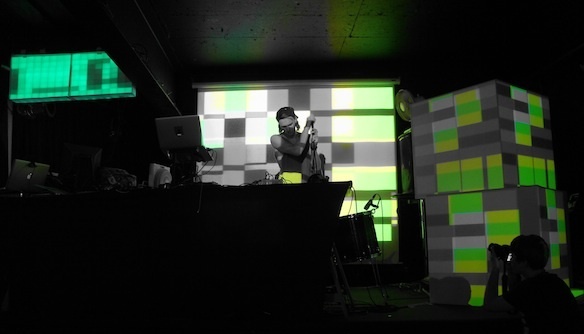 A half hour set of his can be seen in the following youtube clip from a ‘Cheapbeats’ show a few years back. Ralp (website, Facebook) from Spain was up next. I’d never heard of him before, but I was definitely impressed. He played a great set of infectious tunes that wowed the crowd. To top it off, he was a very friendly and personable guy, though my arm twisting to get him to fly to Adelaide for the next Joypad event (only one week later) was thwarted due to him flying back home straight after the event. Oh well, next time! I encourage you to check out his website, there’s several dozen albums worth of his own work and collaborations for free download. I’ve only just started to skim through some of them, but if you’re into chiptunes there’s sure to be something you’ll like. 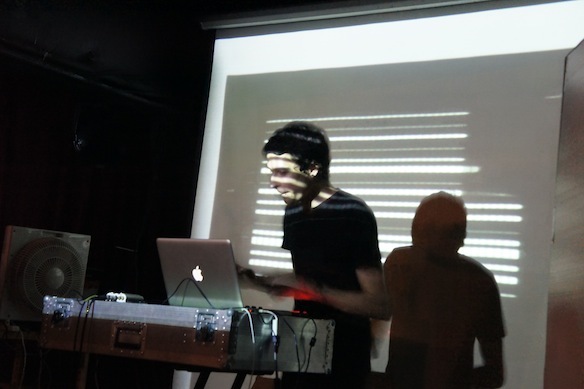 Next up was Cheapshot (soundcloud, Facebook), aka James York (photos above and below), an ex-pat Englishman now living in Japan. I was keen to see him play as he was one of the first artists I found when I really started exploring this style of music. 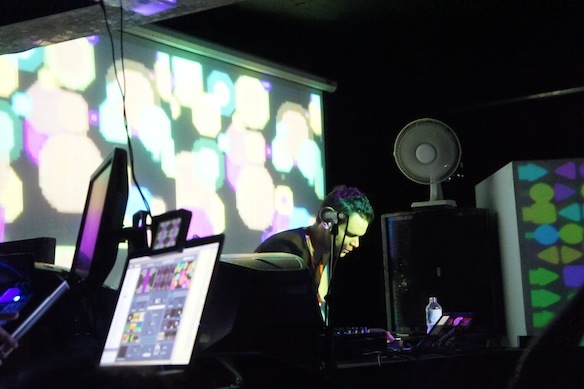 To put it simply, he played an awesome set of dancey, bassy chiptunes. He looked like he was loving it, and the crowd definitely did too. 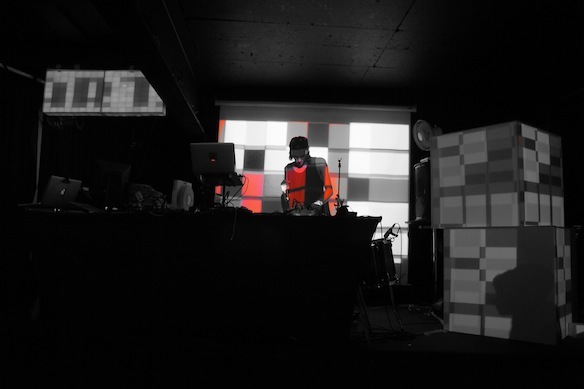 Another friendly guy who was happy to talk about all things chiptune and Japan, I recommend that if you ever get a chance to see one of his sets, go for it post haste…Square Sounds Japan later in the year perhaps! 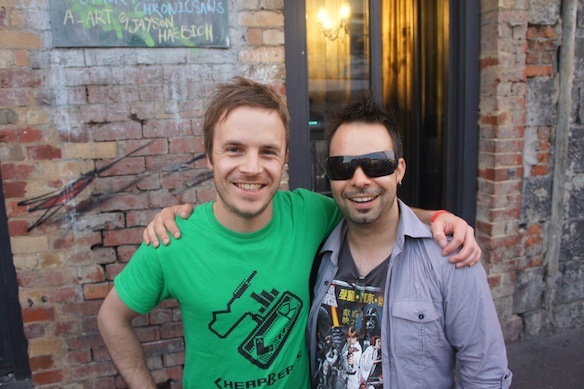 Cheapshot and myself, chatting about Japan and chiptunes…not to mention cheesy grinning. Wrapping up the night was Doshy (soundcloud, Facebook) with a set of hard and grimy dubsteb influenced beats. Jumping up and down like a man possessed, scratching and spinning to an appreciative crowd, I must admit that I was defeated before the end of his set. I headed off to the hotel wondering that if this was ‘only’ the first night, what surprises and interesting acts the ‘main event’ on Saturday would hold. Sweet dreams, a swim in the morning, a bit of shopping around Melbourne’s CBD, and a trip to Mana Bar Melbourne followed during the hours before Saturday’s festivities. Ex-pat New Zealander, now Melbourne local A_Art (Facebook) (one photo above and three below) opened up proceedings on Saturday. Laptop, drums and vocals, this one-man-band (sorry!) 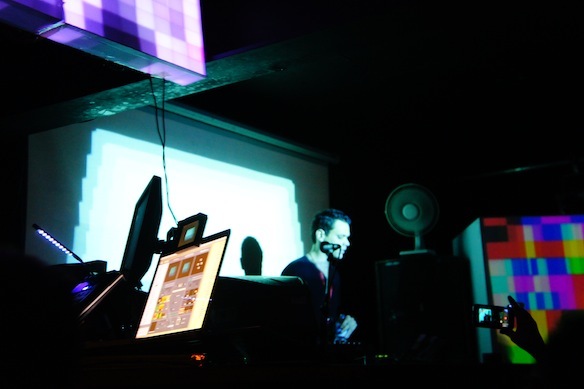 was fantastic, creating a melancholic, poignant and heartfelt soundscape to start the night. 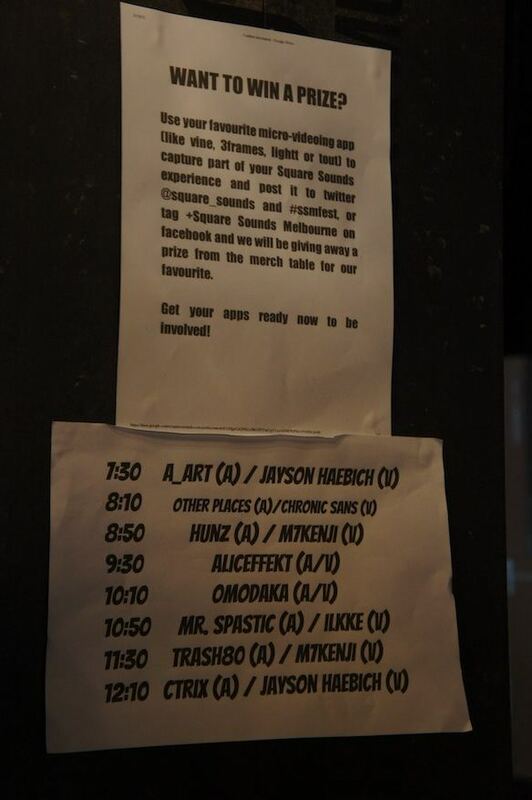 Other Places (BandCamp) followed by Hunz (website) (with a live band) were the next two artists, though I spent too much time socialising and chatting (sorry x 2!) to give an accurate or in-depth rundown on proceedings. They were toe-tappingly good, so do check out their respective links. 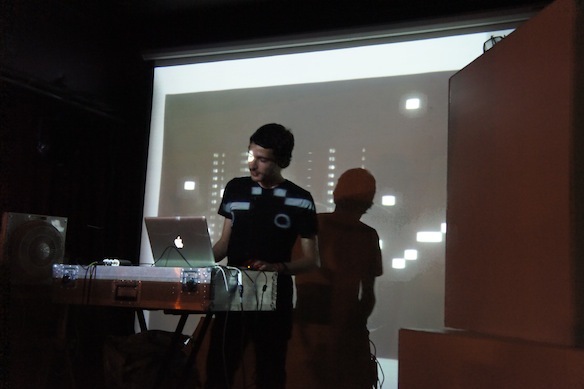 Aliceffekt (website) (photos above and below) is described on the Square Sounds website as having “produced a wide variety of tracks, ranging from IDM, noise, industrial, and ambient.” His music, for mine, definitely echoed shades of Aphex Twin and Squarepusher (amongst others). 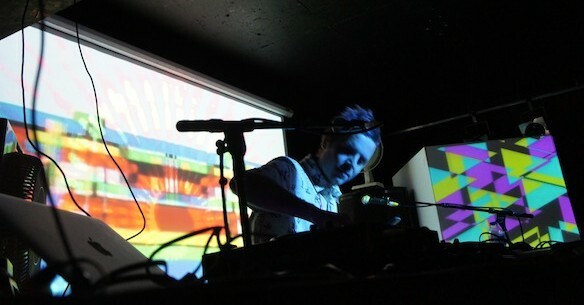 I’ll definitely be chasing up some of his music for those times where more complex and layered sounds tickle my fancy. 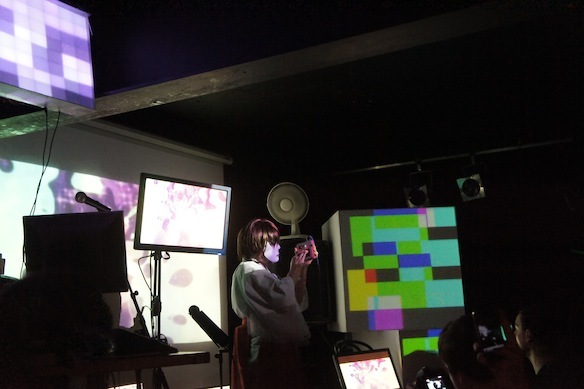 Omodaka (YouTube, website) (one photo above, two below) provided one of the most entertaining, interesting, fun, interactive, (insert further superlatives here, I’m still relatively speechless) live sets I’ve ever seen. 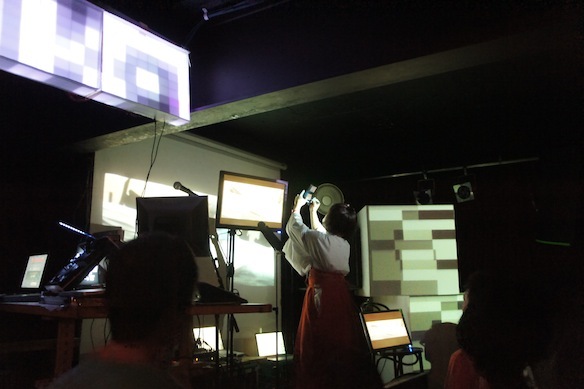 A lady inhabiting the LCD screen to Omodaka’s right provided vocal support by singing traditional Japanese songs (yes, you read correctly), while Omodaka played his tunes on DS Lite, PSP and Gameboy. 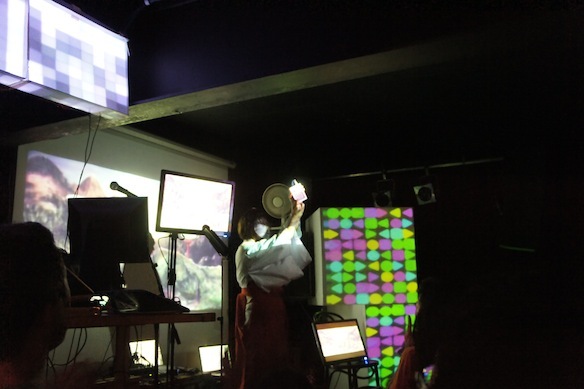 His masked (both face and voice) persona, traditional Japanese garb, theatrical antics, heartfelt tribute to Xevious (on its 30th anniversary), and appreciation for the crowd complemented his wondrous time on stage. 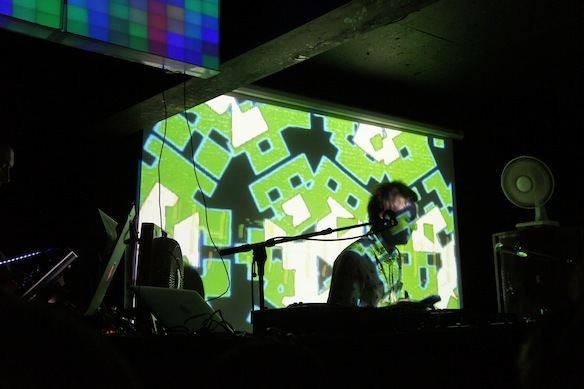 I encourage you to see him live rather than look at grainy video on the Internet…but check out the YouTube video from Blip Festival Tokyo (2011) below if you don’t believe me. 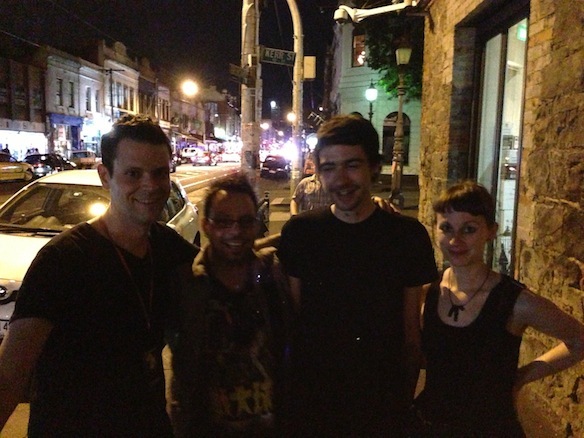 Dodgy, low light, ‘arty’ late night photo of Trash 80, myself, Aliceffekt and friend.